As research has expanded on ARs, new detection algorithms have been developed, and yet no detailed intercomparison has been made. To fill this gap, a grass roots “community” effort was organized to develop an approach to perform such a comparison, which is described in the recently published paper by Shields et al (2018). The community effort is called the Atmospheric River Tracking Method Intercomparison Project “ARTMIP.” It has been organized by a small, ad-hoc, planning committee, co-chaired by Christine Shields (NCAR) and Jon Rutz (NWS and CW3E), with Mike Wehner (DOE/LBNL), Ruby Leung (DOE/PNNL) and F. Martin Ralph (UCSD/SIO/CW3E) as its members. This team organized its first meeting with interested parties in May 2017, which was hosted and sponsored by CW3E at Scripps Institution of Oceanography (SIO). The paper was published in Geoscientific Model Development and titled Atmospheric River Tracking Method Intercomparison Project (ARTMIP): Project Goals and Experimental Design (https://www.geosci-model-dev-discuss.net/gmd-2017-295/). 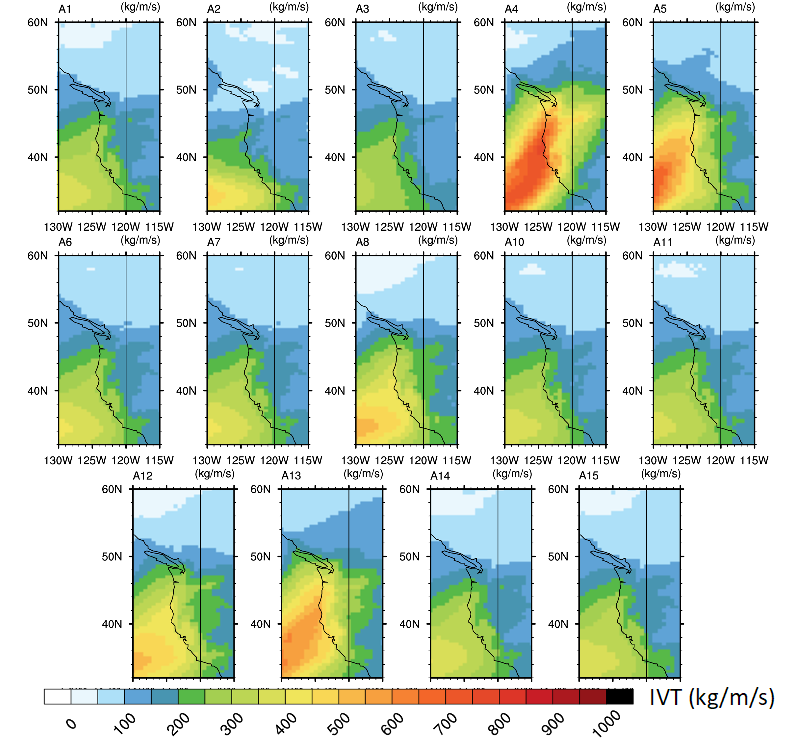 This paper describes ARTMIP, an international community effort to understand and quantify the uncertainties in atmospheric river (AR) science due to the differences in detection algorithms. The goal of ARTMIP is to provide the weather forecasting and climate community with a deeper understanding of AR tracking, mechanisms, and impacts, through providing a framework with which to objectively compare detection schemes that can be fundamentally different. The paper describes the experimental design and timeline, and includes preliminary results that use the key metrics of frequency, intensity, duration, and precipitation attribution (For an example of preliminary results, see figure 1). The project is divided into two tiers with different science objectives. The first tier consists of applying all participating algorithms to a common dataset, the MERRA-2 reanalysis, from 1980-2017. The second tier will be divided into subtopics and consist of sensitivity studies to different reanalysis datasets and to climate model data. A variety of precipitation datasets will also be used to assess uncertainties in AR impacts. The ARTMIP project has been positively received by the AR community and has the potential to shape much of how AR science and detection is conducted. The project has steadily increased participation since the paper was first presented in the open-forum GMD Discussions. Participation in ARTMIP is open to any researchers with an AR detection algorithm or with interest in evaluating the data. If you are interested in participating, please contact Christine Shields (shields@ucar.edu) or Jon Rutz (jonathan.rutz@noaa.gov). Figure 1. Composite MERRA-2 IVT (kg m-1s-1) for landfalling ARs along North American west coast for 14 different algorithms. Time instances where an AR was detected along the coastline were composited for the entire region. Composite data is plotted for February 2017. To test the ARTMIP framework, a 1-month proof-of-concept trial was designed and performed for February 2017. This month was chosen due to large number of landfalling ARs that impacted western North America during this period.